Author(s): Zhipeng Zou, Juan Chen, Jun Yang, Xiaochun Bai. Department of Cell Biology, School of Basic Medical Sciences, Southern Medical University, Guangzhou 510515, China. The evolutionarily conserved mechanistic target of rapamycin (mTOR) forms two functionally distinct complexes, mTORC1 and mTORC2. mTORC1, consisting of mTOR, raptor, and mLST8 (GβL), is sensitive to rapamycin and thought to control autonomous cell growth in response to nutrient availability and growth factors. mTORC2, containing the core components mTOR, mLST8, Rictor, mSIN1, and Protor1/2 is largely insensitive to rapamycin. mTORC2 specifically senses growth factors and regulates cell proliferation, metabolism, actin rearrangement, and survival. Dysregulation of mTOR signaling often occurs in a variety of human malignant diseases, rendering it a crucial and validated target in cancer treatment. However, the effectiveness of rapamycin as single-agent therapy is suppressed, in part, by the numerous strong mTORC1-dependent negative feedback loops. Although preclinical and clinical studies of ATP-competitive mTOR inhibitors that target both mTORC1 and mTORC2 have shown greater effectiveness than rapalogs for cancer treatment, the mTORC1 inhibition-induced negative feedback activation of PI3- K/PDK1 and Akt (Thr308) may be sufficient to promote cell survival. Recent cancer biology studies indicated that mTORC2 is a promising target, since its activity is essential for the development of a number of cancers. These studies provide a rationale for developing inhibitors specifically targeting mTORC2, which do not perturb the mTORC1- dependent negative feedback loops and have a more acceptable therapeutic window. This review summarizes the present understanding of mTORC2 signaling and functions, especially tumorigenic functions, highlighting the current status and future perspectives for targeting mTORC2 in cancer treatment. Keywords: Cancer, mSIN1, mTORC2, mTOR inhibitors, rapamycin, rictor. Affiliation:Department of Cell Biology, School of Basic Medical Sciences, Southern Medical University, Guangzhou 510515, China. Keywords:Cancer, mSIN1, mTORC2, mTOR inhibitors, rapamycin, rictor. Abstract:The evolutionarily conserved mechanistic target of rapamycin (mTOR) forms two functionally distinct complexes, mTORC1 and mTORC2. mTORC1, consisting of mTOR, raptor, and mLST8 (GβL), is sensitive to rapamycin and thought to control autonomous cell growth in response to nutrient availability and growth factors. mTORC2, containing the core components mTOR, mLST8, Rictor, mSIN1, and Protor1/2 is largely insensitive to rapamycin. mTORC2 specifically senses growth factors and regulates cell proliferation, metabolism, actin rearrangement, and survival. Dysregulation of mTOR signaling often occurs in a variety of human malignant diseases, rendering it a crucial and validated target in cancer treatment. However, the effectiveness of rapamycin as single-agent therapy is suppressed, in part, by the numerous strong mTORC1-dependent negative feedback loops. Although preclinical and clinical studies of ATP-competitive mTOR inhibitors that target both mTORC1 and mTORC2 have shown greater effectiveness than rapalogs for cancer treatment, the mTORC1 inhibition-induced negative feedback activation of PI3- K/PDK1 and Akt (Thr308) may be sufficient to promote cell survival. Recent cancer biology studies indicated that mTORC2 is a promising target, since its activity is essential for the development of a number of cancers. These studies provide a rationale for developing inhibitors specifically targeting mTORC2, which do not perturb the mTORC1- dependent negative feedback loops and have a more acceptable therapeutic window. 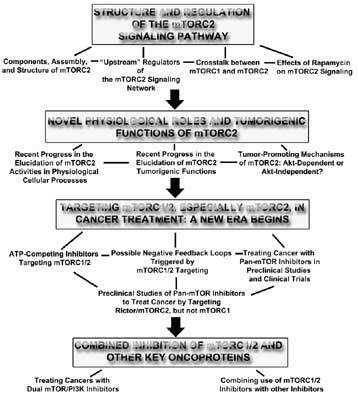 This review summarizes the present understanding of mTORC2 signaling and functions, especially tumorigenic functions, highlighting the current status and future perspectives for targeting mTORC2 in cancer treatment.